Shame on me? No. Shame on her. Today started quite nice: Coffee, fruit loops (don’t judge), and cartoons. Since we had no plans for the day I suggested to Rex that we spend the morning at the zoo. I then got the kids ready. By “get the kids ready” I mean I physically over powered Sydney in order to clothe her. Then she pooped so we did it all over again, but THIS TIME I had the added fun of getting her into a fresh diaper. Bonus points for me because I managed to do so without getting feces on my hands. Rex is at a fun age when it comes to clothes. By this I mean he has strong opinions about what he wears and these strong opinions NEVER reflect the current weather. Somehow I managed to bribe him into seasonally appropriate clothing. As soon as his clothes were on he was overcome by a strong urge to pee. Thankfully, I got him into the bathroom in time for him to make it to the toilet… not that he peed in that though… just near it. Time for socks and shoes. This actually went quite swimmingly and I was encouraged. 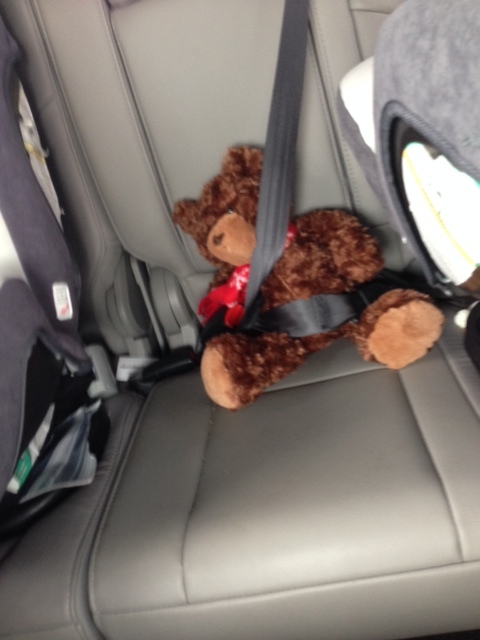 I got the kids strapped into their carseats and off we went. Rex insisted on strapping his teddy bear in. Cute, right? Upon getting to the zoo I was informed that I needed a new membership card because the barcode on mine wasn’t working. This resulted in a decent wait at the member services counter. Naturally, this is when Sydney decided crying was in order, and naturally Rex determined this to be the ideal time to run off and do his own thing. Good stuff. For those of you who don’t know, the wolf pups are now on exhibit at the MN Zoo. I insisted that we see them first. Silly mommy. I should have know that me insisting on anything would send our already “meh” outing into a complete tailspin. Rex started fussing. Sydney continued fussing. I continued walking. We made it to the wolf exhibit only to discover that my efforts were in complete vain. No pups to be seen. Lunch time. Fairly uneventful despite the obligatory near choking incident and spilled milk. After lunch we headed to the play area. Lots of laughs, whimpering, and chasing ensued. Of course they cried when we left, but that’s to be expected, right? Like any good momma I said we could ride the carousel (which was quite a hike from where we were). Sydney refused to ride in the stroller… or walk… so I had to carry her. Rex also refused to walk so I pushed him in the stroller while carrying her. Fun. 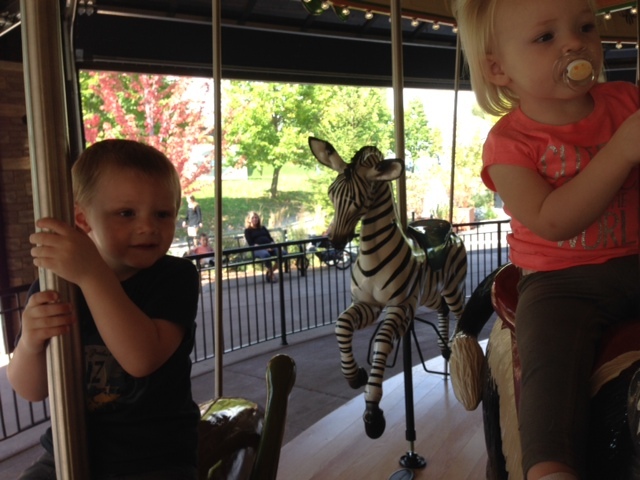 While Rex is a huge fan of the carousel, he refuses to sit on the carousel animals so we usually sit on the benches. Not as fun, but still fun. When our turn was over a kind zoo volunteer gave Rex a free token for another ride. Would he thank her? Nope. Would he even smile in her direction? Not even a little. I thanked her profusely for him, and off we went to get in line for a second ride. This time he wanted to ride an animal! Sydney too. Honestly, I was already exhausted so I decided it was time to go home. This is when the real crying started. His tears were for a pretzel, hers were in protest of the stroller. She screamed, “I waaaa ow!” (translation: I want out) while he tearfully lamented that he was STARVING! I was trying to keep it together. Really. I asked Sydney if she wanted to walk. “Uh huh,” she responded. I made the poor decision of believing her. As soon as her feet hit the ground she was wailing for me to “Ho her!” (Translation: hold her). Rex continued to cry for a pretzel while simultaneously insisting that I hold his hand. Sydney followed me scream crying all the while. I was done… I had reached my threshold… At this point I determined I had three choices 1) Cry, 2) Scream, or 3) Laugh. I laughed. I also turned around to snap a picture of my screaming Sydney (for prosperity of course). A grandmother and her child were not far behind us. As they passed the grandmother gave me the most chilling, awful stare and muttered something under her breath. It was dripping with condescension and judgement. I shame spiraled and sulked the rest of the way to the car. Rex fussed, and I caved and carried Sydney. I was a bad mom. I lacked patience. Because they didn’t leave the zoo smiling, I could only reason that I had failed. Thankfully, my shame spiral lasted only until I reached the car and my rational brain kicked in. That woman hadn’t seen all the moments leading up to that one. She didn’t know the culmination of things that brought me (and my daughter for that fact) to that point. Who was she to judge me? Perhaps my laughter did seem odd, but given the context it was really quite logical. Laugh, scream or cry. Those were my choices. 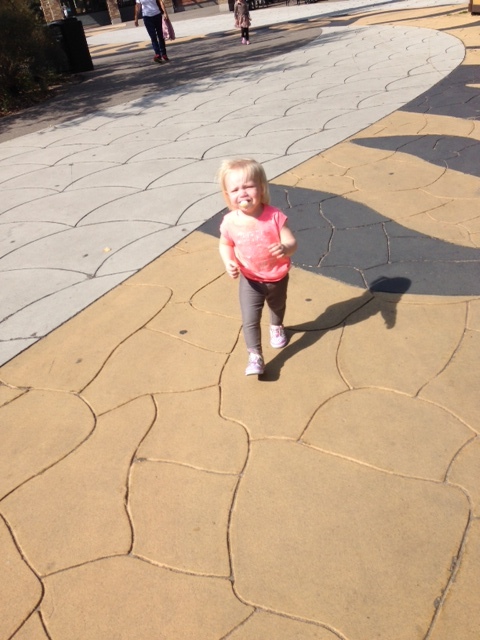 I was having a “moment” (as all parents do)… She was just being judgmental. Shame on her. This entry was posted in Confessions, Littles. Bookmark the permalink.